Introduced in January 1983, Apple’s Lisa shipped that June. The first consumer computer with a WYSIWYG (What You See Is What You Get) display, a GUI (Graphical User Interface), and a mouse, its $10,000 price tag made it anything but successful. Only 11,000 original Lisas were sold. Lisa had a whopping 1 MB of RAM, an unprecedented amount in an age when PCs could use at most 640 KB. That’s also more RAM than any Mac would have until the Mac Plus arrived in january 1986 – three years later. Unlike Macintosh computers, Lisa does not have square pixels. Instead, pixels are 50% taller than they are wide. Its 720 x 360 pixel 12″ display had about 50% more pixels than early Macs, and it wasn’t until the Mac II arrived in March 1987 that Macs had comparable resolution with their new 640 x 480 pixel screens. The original Lisa was replaced by the Lisa 2 in January 1984 (the same month the first Macintosh was introduced) – and Apple even offered a free upgrade to owners of the original Lisa. A year after it was introduced, the Lisa 2 was renamed Macintosh XL as some software changes were made to make the Lisa compatible with the Mac OS. Got a Lisa? Join LisaList. 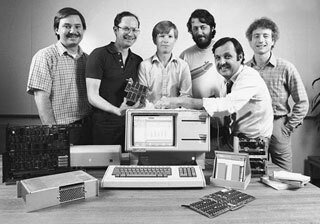 Apple Lisa group on Facebook. Lisa’s DNA is all over modern computing, Ray Arachelian, Apple Seeds, 2007.06.06. Those who label Apple’s Lisa a failure are ignoring the computer’s legacy that shows up in every personal computer sold today. Using Apple’s Lisa for real work, Ted Hodges, Vintage Mac Living, 2007.04.02. The Lisa Office System has some advantages of modern computers for word processing and other production work. Bringing my Apple Lisa back to life, Ted Hodges, Vintage Mac Living, 2007.03.26. The floppy drive wasn’t working the keyboard was rough. Some homebrew fixes got everything working again. Lisa emulator released, allows OS X and Windows users to experience Apple’s Lisa, Ted Hodges, Vintage Mac Living, 2007.02.27. Nearly a decade in the making, the Lisa Emulator Project now has a working Lisa emulator for Windows PCs and OS X Macs. Interview with Ray Arachelian, creator of the Lisa emulator, Ted Hodges, Vintage Mac Living, 2007.03.13. Ray Arachelian spent most of a decade creating the world’s first working Lisa emulator. Why he did it and some of the obstacles he had to overcome. A history of Apple’s Lisa, 1979-1986, Tom Hormby, Orchard, 2005.10.05. Originally envisioned as a business computer to replace the Apple II, the Lisa brought the mouse and GUI to the computer market – only to be felled by the less costly Macintosh. The Lisa legacy, Dan Knight, Mac Musings, 2003.01.20. On the Lisa’s 20th anniversary, we should remember how Apple’s innovation paved the way for all future computers. The innovative Lisa, Dan Knight, Online Tech Journal, 2001.05.31. Perhaps the most innovative computer before the Macintosh, Lisa paved the way for a GUI future. The History of Human Computer Interaction, Gerhard Erich Mischitz, 2001.01.23. Human computer interaction from the first computers through Windows 1. 20 Spectacular Failures, Byte, 1995.11. One paragraph on the Lisa – and one on the ill-fated Apple ///. Lisa Emulator Project. A work in progress.